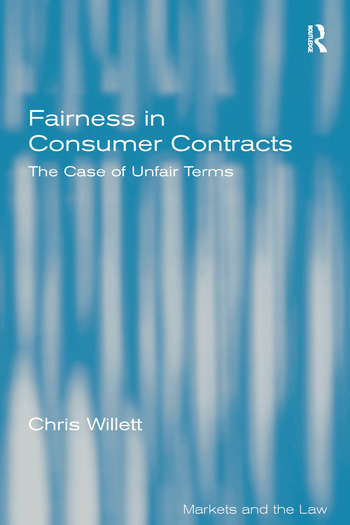 This book focuses on unfair contract terms in consumer contracts, in particular the existing legislation and the proposals by the Law Commissions for a new unified regime. In this context it considers, in particular, what we mean by fairness (both procedurally and in substance); the tools used; the European dimension; the move from general principles from the more piecemeal approach typical in UK legal tradition; and the further move in this direction as a result of the Unfair Commercial Practices Directive. Contents: Preface; Introduction to fairness issues; Freedom, fairness and testing for unfairness; Introduction to the fairness regimes; Default rules, reasonable expectations and reasonableness under UCTA; The Unfair Terms in Consumer Contract Terms Regulations (UTCCR); The general fairness reviews - UCTA, UTCCR and the new test; A broader view of the fairness regimes described; The transformation; Reviewing the rules on unfair terms in consumer contracts and surveying the bigger picture; Index. Chris Willett is Professor of Consumer Law at De Montfort University, UK.